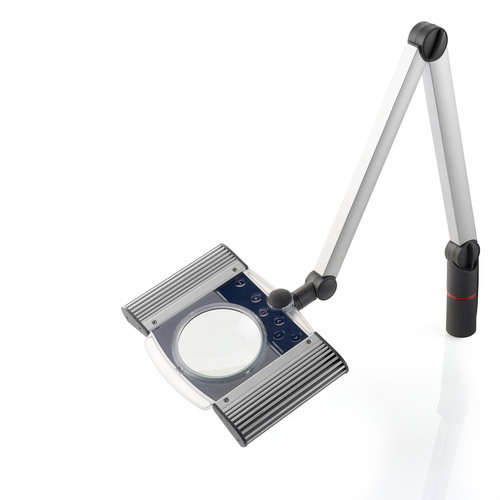 The ZL3 Task Light comprises of a large 127 mm 3-diopter magnifying lens, an adjustable arm (which can be clamped to work surfaces of 55mm or less) and two sets of LED lights. What makes the ZL3 unique is that its’ LED lights can be adjusted independently, with 10 dimming settings up to a brightness of 3000 lux. This offers a number of advantages over conventional fluorescent task lights. Firstly, LED technology, in itself, is superior to fluorescent lights for precision tasks. Rather than illuminate the entire work area, LED lights can be directed onto the object itself, saving energy and improving control over light direction. In fact, the ZL3’s power consumption is so low that the lights can last for decades without need of replacing. Secondly, the ability to independently adjust the brightness of the lights on either side of the magnifying lens provides improved control over light contrast and shadows. This enables operators to optimise the illumination of specific parts and components, and consequently enhance the precision with which they can make even the tiniest adjustments. Another important benefit of the ZL3 Task Light is the elimination of eye strain. Conventional fluorescent lamps can flicker as they heat up and in response to power fluctuations. This flickering can cause eyes to become sore and watery, blurred vision, tiredness and even headaches after prolonged exposure. The ZL3’s LED lights, however, provide a constant beam from the moment it’s switched on until it’s switched off. This means operators don’t have to wait for the light to warm up and can perform precision tasks quicker, in comfort and for longer periods of time. The ZL3 Task Light is expected to be a popular choice for use in any environment where visual quality control is vital, such as in technical labs, R & D, precision mechanics, mould makers, watchmakers and many other precision craftsmen. As well as the ZL3 Task Light, Treston also supplies an Overlight and Sidelight, which both offer flicker free illumination and can be attached to its wide array of technical workbenches. Further information on the ZL3 Task Light, technical furniture and other products in Treston’s range can be found on its website, where you can also place orders online. This press release was distributed by ResponseSource Press Release Wire on behalf of The Copywriter's Crucible in the following categories: Manufacturing, Engineering & Energy, for more information visit https://pressreleasewire.responsesource.com/about.